Please contact all the below listed distributors/manufacturers for Bisphenol A and ask for prices, package standards and transport possibilities. Our registered distributors will help you to get all necessary information and product specifications. World-wide manufacturer and supplier of chemical and pharmaceutical ingredients. 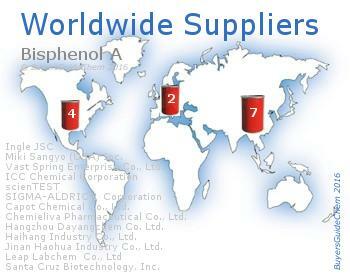 ICC Chemical Corporation is supplier for Bisphenol A. Sodium sulfate anhydrous is also served by ICC Chemical Corporation. Company was founded in 1993 on basis of a chemical facility in Ingliste village, Rapla County. As a result of increasing capitalization and incorporation with emerging chemical trading companies, starting from 1998 there is a considerable multiple raise in turnover and activities. Ingle JSC is supplier for Bisphenol A. Additionally Barium chloride is supplied by us. We are a manufacture of fine chemicals in Taiwan. Bisphenol A diacrylate, ethoxylated (10) will be also provided by us. We are professional in producing specialty chemicals in various industries, including coating, adhesive, compounding, plastic, rubber, pharmaceutical, electronic and optoelectric. Vast Spring Enterprise Co., Ltd. is supplier for Bisphenol A.
Haihang Industry Co., Ltd.,is a leading producer and supplier of chemicals industry in china. By integrating people, technology and potential, we endeavor to make contribution to the betterment of human society. Haihang Industry Co., Ltd. is supplier for Bisphenol A. We develop, produce and distribute high quality pharmaceutical chemicals, special chemicals and other fine chemicals. We are seller of Aluminum alloy. Janex S.A. is supplier for Bisphenol A. We provide n-Nonane as well. Soluble in methanol (50 mg/ml), water (0.30 mg/ml at 25 °C), and DMSO. Haihang Industry Co., Ltd.,is a leading producer and supplier of chemicals industry in china. By integrating people, technology and potential, we endeavor to make contribution to the betterment of human society. We develop, produce and distribute high quality pharmaceutical chemicals, special chemicals and other fine chemicals. Aluminum alloy will be also provided by us. Merck Schuchardt OHG, a 100% subsidiary of Merck KGaA, Germany, has, for the last 150 years, been one of the leading German producers and suppliers of organic intermediates, fine chemicals, reagents and solvents for laboratories, medium-sized and bulk production. We supply our chemical product 2,3-Dimethylaniline.